So, I stopped and thought, and pondered, and started looking at color swatches. I found so many ideas that I loved. And then I talked to my husband (Since it is his bed too I figured he should get some input) and after some debate (he drives a tuff bargin) we came to the decision that we wanted something calming, relaxing, and in his words, no "girly" stuff. I later clarified that "girly" stuff includes anything in any tone of pink, red, or purple and also includes any prints that have any form of a flower on them. 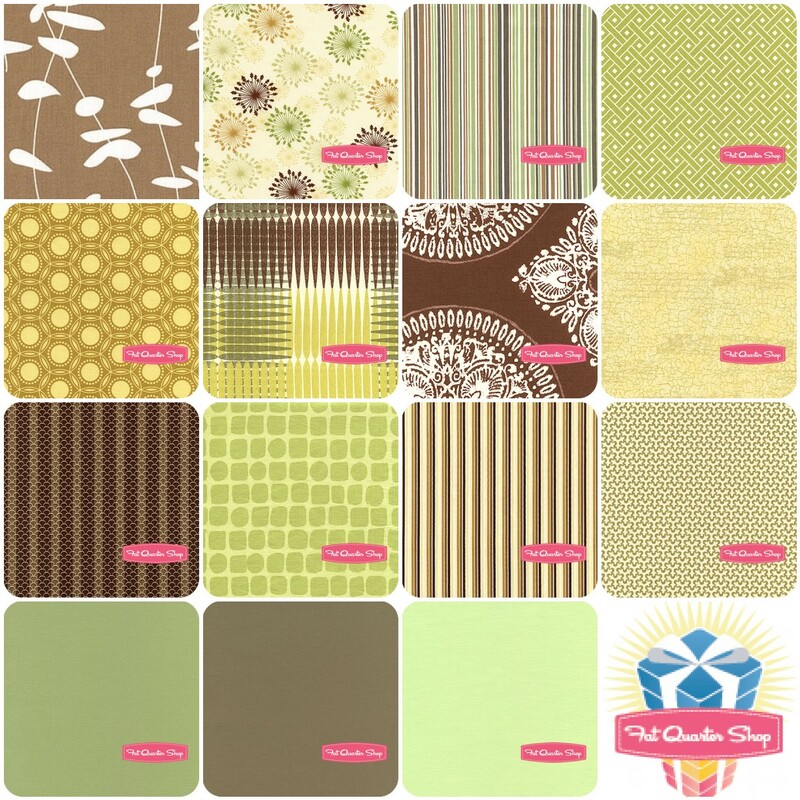 Which from my original color ideas left me with one option of a nice combination of earthy tones in the green tones of our walls. So off to the Fat Quarter Shop I went to look for some fabrics that fit the "rules". I went through every single fabric in the shop. (Ya, it was so much fun!!!!!) I can't believe how many great prints I had to "throw out" because they had flowers. It is a little harder to shop for strictly masculine prints :) But in the end, I was super happy with what I ended up with. And here it is :) What do you think??? Is it calming and relaxing?? Is it masculine and in no way girly?? I love your palette and think it is a nice compliment between masculine and girly! I think it fits the rules nicely! It's perfect. Now what design? It's a very relaxing pallette. Also, the color scheme you picked out is fantastic! Very calming and earthy. I like it a lot....and I haven't seen what pattern you are using....but I feel like you could use another gold and maybe eliminate one of the solid greens. My overall impression is that the brown dominates. But I think it really works with the criteria your husband gave you. Glad you asked him before you made it.....it's nice to see that he cares what is on his bed too. I know my husband would have an opinion. I'm sure whatever you make will be beautiful and I hope you are not offended with my comment. Love your colors and prints, and I think you are spot on for both masculine and girlie. I would love to buy this bundle! Good luck. I can not wait to see who wins. I like it, and think it will be soothing--making your room a bit of a haven, which is a wonderful feeling. I know that my sweetheart would give me grief over the brown medallion print in the second row because he thinks anything "swirly" (paisley, medallions, etc.) are girly, but when I put them into quilts with many other prints & solids they are diluted enough that he doesn't notice them. I appreciate that you are sincerely trying to find fabric and colors that he'll like, because I think so often women decorate a home to reflect only them, and you can see it the moment you walk in. And even if that's okay in every other room of the house, a master bedroom should be a place where both people feel "at home". Gosh ... just love the colours you have chosen ... can't wait to see them coming to life! I think you've picked out a really great combination. My husband would like it too. Definitely calming. Original and classic. I love it. Looks great...even though I know nothing about quilting! Just tell Jake that he needs to remember it's YOUR bedroom too! haha. I think it's definitely masculine and not girly at all! Looks great! Nice, subdued, classy. Love the first print whatever it is! This is a great palette for a relaxing, zen bedroom - it's similar to what me and my dude (who might also be opposed to "girly" elements) are looking to use in our own bedroom!